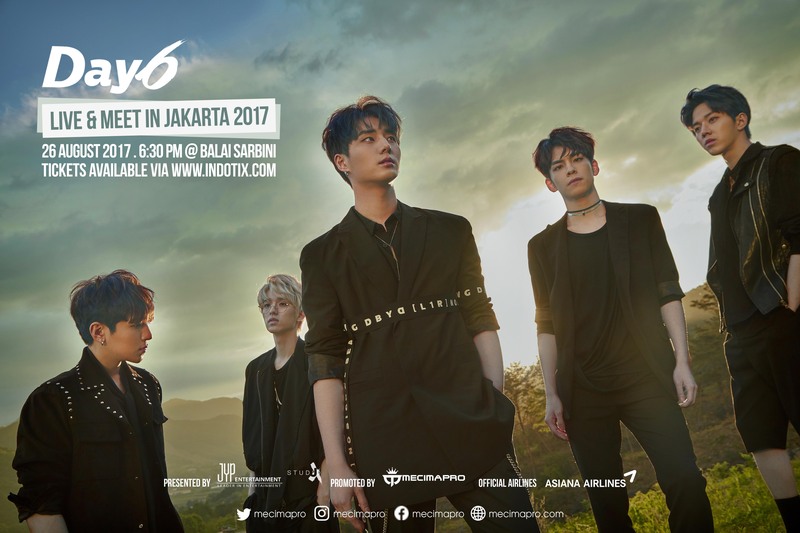 JYP’s Rising group band, DAY6, finally announced their first visit to Indonesia to greet their fans here through a fan meeting, “DAY6 Live & Meet in Jakarta 2017”. DAY6 will meet their fans on Saturday, August 26th at Balai Sarbini, Jakarta with the fan meeting which will start at 6.30pm. DAY6 first appeared on one of the episodes of YG x Mnet’s survival program “WIN: Who is Next” as trainees’ from JYP Entertainment. They appeared as 5-member group band, 5Live, consisted of Sungjin, Young K, Jae, Wonpil, as well as their former member, Junhyeok, and later added drummer Dowoon and officially debuted as DAY6 in 2015 with “Congratulations”. MecimaPro has officially announced details of the fan meeting’s seat plan and date of ticket sales. Starting from 15th June 2017 at 15:00 WIB, MCP Fanclub members can purchase the BLUE Tickets with benefit either FANSIGN or GROUP PHOTO, fans need to choose between those benefits (MCP FC only sell BLUE TICKET). As for public sales will start on 16th June 2017 at 15:00 WIB, fans can purchase PINK, YELLOW, PURPLE tickets at Indotix or Indotix Outlets (STC Senayan, Taman Palem and Kelapa Gading). Ticket prices starting from Rp. 800,000 for PURPLE, Rp. 1,900,000 for PINK and YELLOW (with Hi-touch benefits), and Rp. 2,500,000 for BLUE (FANSIGN or GROUP PHOTO). Further information please follow MECIMAPRO on Twitter, Facebook and Instagram: @mecimapro.